Tricia Langman has over eighteen years experience designing for prestigious fashion companies worldwide, including Ralph Lauren, Calvin Klein, Halston, Kashiyama, Donna Karan, Nicole Miller, Anthropology, Banana Republic and Target. Projects include work featured at the Costume Institute of the Metropolitan Museum of New York City, and a hand-painted designer gown for Celine Dion for her performance at the Grammy Awards ceremony of her Oscar winning song “My Heart Will Go On”. 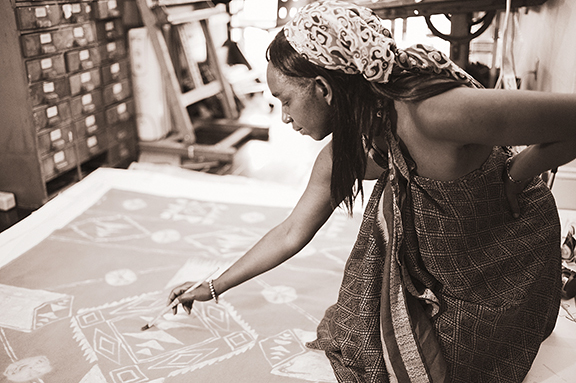 Founder and design director of the successful international Textile Print design studio Spoogi, while concurrently adjunct lecturer at the Art Institute of Portland.Current projects include designing a limited edition blanket throw collection under her own label for Pendleton Home to launch in Spring 2015 and working on her book the Art of Batik. Copyright © 2019 Tricia Langman.All rights reserved.